The market rose strongly on Thursday. NYSE advancers outpaced decliners by over 3 to 1 – the 2nd day in a row advancers accounted for over 70% of the total. I’ve noted a few times recently that rallies in the S&P 500 since the end of May have been quick to reverse. Most have not lasted more than 2 days before suffering a down day. There have been three 3-day rallies and none of four days or longer. The market has now closed up 3 days in a row. We are reaching the upper boundary of “normal”. Although I’m not betting on it, traders should be on alert for a change of character in the market. The market may or may not pull back in the next day or two, but it appears likely to happen quite soon. Back to back days of 70% advancers are fairly rare. The fact that it happened without the S&P 500 posting a 10-day high is even more unusual. Since 1970 this has happened 20 times. Sixteen (80%) of the time the market closed below the close of the trigger day within the next four days. If you give it 10 days to work off the overbought breadth readings then 19 (95%) of the time you’d find a close lower than the trigger day. In other words, a pullback appears likely in the not-too distant future. I believe one key to determining whether the market character is possibly changing and a new leg higher possibly beginning will be the action on this pullback. This is the 7th rally of 2-3 days since July 21st. The previous six saw a decline of at least 1.2% on the first day of the pullback. That’s not orderly and not really what you want to see. In fact, other than the July 21st 1-day mini-pullback the last “orderly” pullback that didn’t involve a sharp drop occurred on the last 3 days of April. Seems to me it might be a good time to be thinking about taking some short exposure. If the pullback is orderly, you can flip to the long side. If the pullback is sharp like the rest have been, it could mean a nice, quick, short trade. One relatively new blog I’ve begun to read and enjoy is MarketSci. Over the weekend I decided to check out some the past posts and studies on his blog. I was surpised to find one post eerily similar to my own Trend vs. Chop study that he published in July. Michael’s findings agreed with my own with some additional twists. He also looked at results above and below the 200-day moving average, and he looked at bonds as well. I’ll be expanding the study again and publishing some results based on weekly bars a little later. MarketSci also had an interesting post last week which expanded nicely on my recent SOX studies suggesting the SOX can act as a leading catalyst for the broad market. If you trade trend or breakout strategies and have found the market difficult in the last year or so, I’m about to show a prime reason for that diffuclty. Below is a strategy that buys the S&P 500 on the close of any up day. The position is closed at the close of a down day. Essentially your looking to buy strength and sit out weakness. This strategy worked well in the 90’s, but since the market topped in 2000, it has performed poorly. Since the Spring of 2007 it has really accelerated lower. What this means is that performance following up days has been especially bad. It suggests the environenment has been especially choppy. Whereas strength begat strength in the 90’s, it has led to immediate weakness since. Now let’s take a look at downside follow through. In this case the strategy is to sell short on any down day and then cover on an up day. This was a break-even strategy through July of 2002. Since then it has done terrible. Interestingly, it’s done especially bad over the last year plus. Even though the market has fallen precipitously, the manner in which it has occurred has made it difficult to profit if you’re trying to short breakdowns. Down days have been followed by up days. Again, since March 2007 this strategy would have experienced an incredible freefall. Perhaps it would be best to take a step back, though. In the next chart I show back to 1960 instead of 1993 in an effort to find other periods where choppiness has been so prevalent. As you can see, buying after strong days and selling after weak ones worked well for 40 years. In 2000 that changed, and the last year and a half is the worst it has ever been with regards to follow through. This would suggest that strategies that may have worked well for forty years or more could be suffering greatly now. Traders should consider the current choppy market behavior when designing strategies. Buying weakness and selling strength is working better than buying strength and selling weakness. They could also monitor charts like these to see if tendencies begin to revert back to pre-2000. If tendencies do revert, adjustments may be needed. Update: I just saw that Dr. Brett Steenbarger also addressed this topic in his blog today. He looked at it from an international standpoint as well. Click here to see his findings. Of course volume this week and next week are expected to be a bit lighter due to traders taking vacations. Still, I don’t find the results terribly encouraging for the bullish case over the next two weeks. The kind of positive persistence we’re seeing often manages to continue higher over the following weeks and months. This is the 2nd time it has happened in a week. There have been only three other occurrences where the setup has triggered twice in a 1-week span. They were 4/10/96, 3/7/00, and 5/10/04 - all followed by nice rallies in the next few weeks. Time for a shameless plug. That weakness came on Monday the 4th and those who bought into it should have done quite well over the next few days. In last night’s Weekly Research Letter I showed a study that triggered on Friday the 8th at the close. 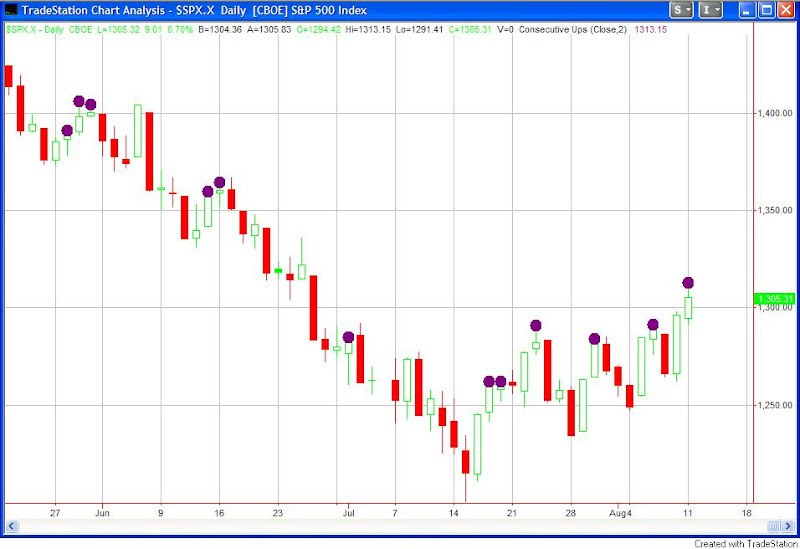 When this setup occurred the S&P 500 had posted gains the following day 14 times in a row. Today made it #15. Give yourself a Quantifiable Edge. For less than the cost of 1 buy and 1 sell order at most brokers you’ll get my most in depth research every weekend. If you haven’t yet received a sample Research Letter, just send an email with your name and email address to weekly@quantifiableedges.com and I’ll send you the August 3rd Letter which includes the above mentioned system. For more information or to subscribe, click here. These results are worse than the 1st case where lows exceeded highs. So while the market may pull back (which it frequently does after making 30-day highs), the blame shouldn’t be laid on the lagging number of new highs. On Tuesday the low put/call ratio and the reaction to the Fed suggested a pullback was likely to occur soon. Wednesday the volume pattern made the same suggestion. Thursday the market dropped hard. The S&P and Dow both lost almost 2%. The Nasdaq just under 1%. There’s no telling whether this drop will continue over the next few days, but for the bulls there is a silver lining in today's action: Semiconductors. Not only are the % wins and average trade columns notable here but the massive volatility as well. Look at the size of the average wins and losses when you go out 4-6 weeks. Even over the next two weeks they’re huge. If you’re bullish, the stats are compelling. If your unsure, then a volatility play might be something to consider. I’ve showed before how light volume in a stongly rising market will often lead to a pullback. Wednesday’s market action set it up in a slightly different way. It does provide another nice example though. Three bearish short-term studies all looking at different indicators the last two nights. Upside may be a bit limited over the next week or so. Score tonight Bears 2 – Bulls 0 (for the short-term). While the SPX was up over 2% today, I used a 1% spike to ensure a decent amount of instances. More often than not the market tended to pull back over the next couple of weeks. While the downside edge isn’t huge on a percentage basis, the risk is quite a bit higher than the reward. Overall not encouraging for the bullish case over the next 2 weeks. Based on this, there appears to be a small edge to the upside for Tuesday. Last week I looked at some moving averages of the CBOE Put/Call ratio. I compared the 10-day average to the 200-day average. The 10-day average gives a sentiment snapshot for option traders. The ratios have risen gradually over the years as the market has evolved. The 200-day average helps to normalize the 10-day readings. What was shown last week is that when the 10-period moving average is below the 200-period average, the market over time has lost money. When the 10-period moving average has been above the 200-period moving average, the net results over time have been a gain. I decided this week to take a closer look. As it turns out, the results are not quite as cut and dry as they may appear at first. I used the same time period so that the numbers would match up. The column on the left shows the 10ma/200ma ratio. Returns are broken down by range. For example, on July 25th the 10-day average of the CBOE total put/call ratio was 0.96. The 200-day average was 1.03. Dividing the 10 (0.96) by the 200 (1.03) gives a result of about 0.93. Therefore, July 25th would have fallen into the 0.9 – 1.0 category. Points gained and lost are totals for the day following the reading. I found these results quite interesting in a few ways. First, ratios just below 1 were bearish while times when the 10ma was strongly below the 200ma actually resulted in gains. I suspect this is due to the fact that the extremely low readings may be the result of a strong move to the upside. Strong moves up are more likely to continue up than weak ones. Also interesting is the fact that 1.1 – 1.2 shows a negative return going forward. I suspect at this point the market may often be downtrending. Readings higher than this could signal exhaustion, which is why they results in positive days going forward. An uptrending market with a little skepticism (1.0-1.1 reading) may be the sweet spot when looking for long-term gains. While in general you'd rather see some skepticism with a ratio greater than 1, it’s not quite as simple as saying greater than 1 is good and less than 1 is bad. Another Large, Low Volume Drop - Massive Edge or Statistical Anomaly? The number of instances is too low to make much out of but the size of the returns is certainly eye-popping. An average return of over 5% in the next 7 sessions. That’s a substantial pop to say the least. For those who would like to review the dates, they are all listed below. Notice how 2002 dominated the study. While not statistically significant, I find the results noteworthy and interesting. So to the header question: Are we looking at a massive edge or a statistical anomaly?